The lower trapezius (G. trapeza, four-sided or four-legged table.) is not an individual muscle, itself, but rather it is the lowermost section of fibers in the trapezius muscle. It acts on the scapula, with its main role as the prime mover in scapular depression. Also worth noting is its important role as a scapular stabilizer: it is a synergist in scapular upward rotation, which is required for raising the arm overhead through a full range of motion. It is a superficial posterior axioappendicular (extrinsic shoulder) muscle, located on the thoracic spinal region of the back. It’s in the most superficial layer of muscle, sitting atop portions of the rhomboids, lats and infraspinatus. The lower trapezius originates from the lowest six thoracic vertebrae. It has parallel-oriented fibers that run superolaterally and converge as they approach their insertion on the medial scapular spine. …People’s lack of awareness of the lower traps is one reason why it is weak in the vast majority of people, weight trainees, athletes and general population alike. Note: Most of the Y exercises can be done unilaterally (one arm at a time). This can improve activation and technique when first starting lower trapezius training. The various I, T and W exercises, which target the rhomboids and middle trapezius (and external rotators), also work the lower traps significantly, albeit less directly than the Y exercises. The following stretches are the same as those for the rhomboids. 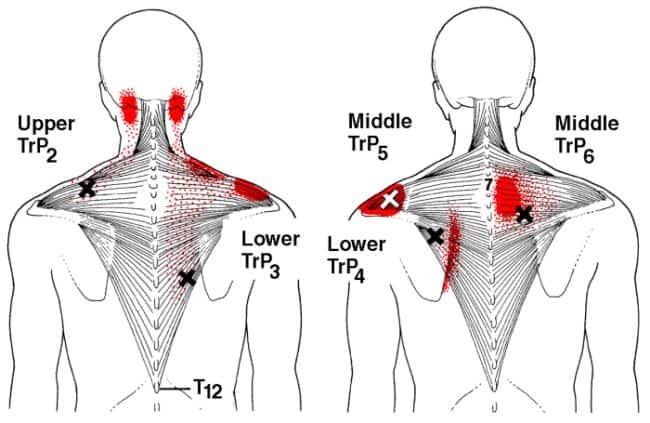 When using these techniques, give special attention to the trigger points labeled TrP3 and TrP4 in the image below. Inhibited/Lengthened Lower Trapezius: The lower trapezius is inhibited and long in individuals with upper crossed syndrome (UCS). The excessive thoracic kyphosis and scapular protraction that comes with UCS, causes the lower trapezius to get stretched out and weak. One effect of lower trapezius inhibition is the reduced ability to posteriorly tilt the scapula during scapular upward rotation, which is required for proper overhead arm movement. When this can’t happen properly, there’s increased chance of shoulder impingement and overhead range of motion is restricted. The reduced overhead mobility is often compensated for with excessive lumbar extension and jutting the head forward. Also, lower trapezius inhibition causes poor scapular depression, which leads to poor technique on upper body pull exercises because your scapulae tend to stay in an elevated position. This restricts scapular mobility and forces you to rely on arm strength and lumbar extension (for momentum) to lift the weight on pull exercises. Strengthen lower trapezius with direct exercises. I recommend starting with scapular wall slides and unilateral prone floor Y raises. Once you get the hang of those exercises, you can add another exercise or two, and use the bilateral Y raise variations. Reduce the use of heavy overhead presses until you restore your lower trapezius strength and improve your overhead range of motion. In the mean time, you can do the high incline shoulder press for heavy shoulder work. Address the other issues related to upper crossed syndrome, which is (most likely) the root cause of your lower trapezius weakness. See how to fix upper crossed syndrome (article coming soon) for specific details. Even if you don’t have any postural issues or any (noticeable) lower trapezius dysfunction, it’s still a good idea to include some lower trapezius exercises somewhere in your training. Pretty much everyone stands to benefit from stronger lower traps. Enjoy your articles . Is there a problem with the images……I have never ben able to see any of them, waiting smetimes up to half an hour while reviewing the article. Hi Jane. Sorry for the confusion. 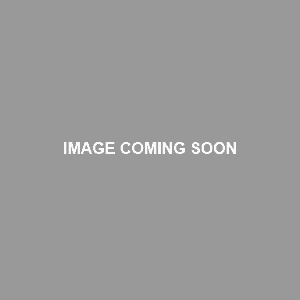 Unfortunately, there are no images (yet). Eventually, I will be going through all of the anatomy pages and adding images, but I can’t give you an exact date for when that will be. Great article!!! I have a question though, I have been trying to figure out my shoulders/back situation for over a year now with little to now help. Whenever retract my scapula at all, I get pain in-between my shoulder blades. I have gone to a few physical therapists and chiros + got MRI’s and only thing they say is I have to pull my shoulders back and strengthen lower traps and rhomboids. But the problem is if I pull my shoulders back at all, that’s where the pain comes from. I just started getting deep tissue massages around my scapula and that helps tremendously but its only temporary. I am just confused on what is going on??? Excellent posts, I am enjoying the anatomy articles with common issues and how to fix them. When is the article on how to fix UCS coming out? I can see the posts are fairly old, hope you haven’t forgotten about it! Hi Mario, thanks — Unfortunately, I’ve but that article on the backburner for now. However, if you have any specific questions about UCS, just ask and I’ll do my best to answer you here.